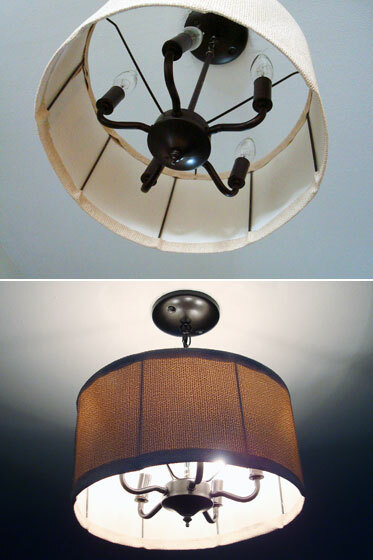 I have another thrifted light fixture makeover for you today. Remember this beauty from my thrifting post? 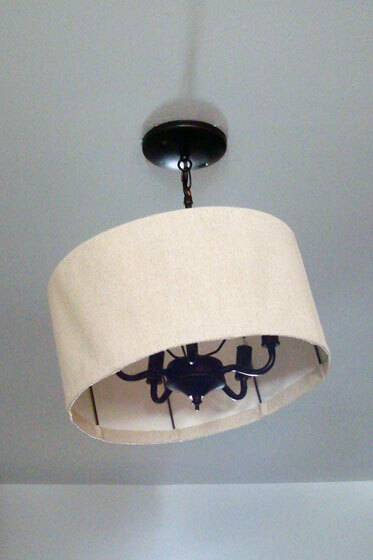 My plan for the foyer was to replace the giant ceiling fan with a small chandelier covered by a simple drum shade. Here was my drum shade. 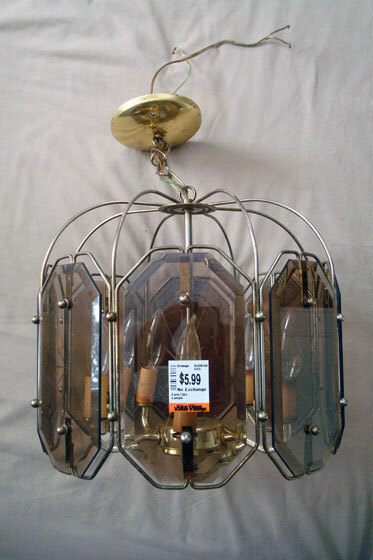 It was vintage lighting fest over here. 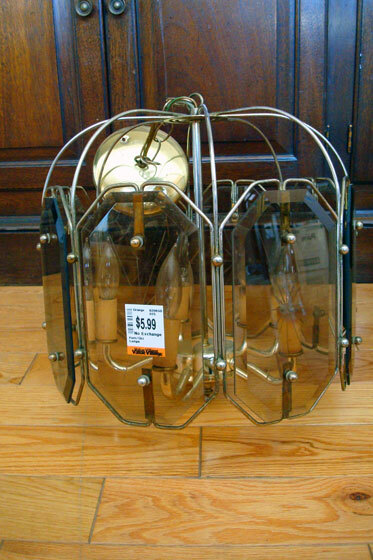 I took apart the light, took apart the shade, merged the two together and spray painted everything oil-rubbed bronze. I shortened the shade and added a new fabric cover. Then I installed it over the stairwell. Hmmm… not quite what I envisioned. As Matt said, “Woman, what were you thinking?” I stood there and laughed. Then I got out my glue gun. A couple of daubs of glue held the shade a bit straighter. I’m still not sure if this is quite what I envisioned. The inside looks a bit rough in some spots, and the ribs of the shade show through when the light is turned on. 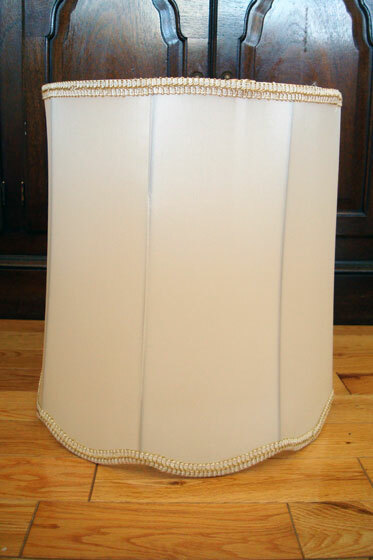 Another layer of fabric on the inside might solve both of these issues, but it would also lessen the light. 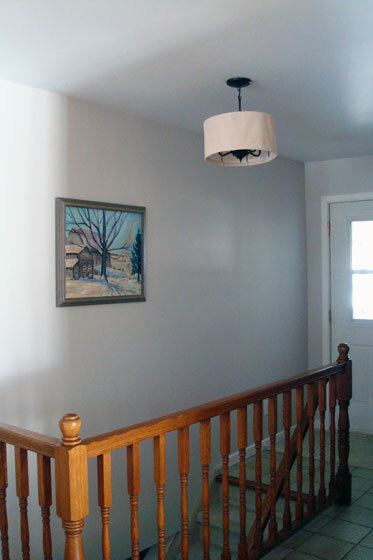 This light is much brighter than the ceiling fan that was there before, which I like as our foyer tends to be a bit dim. I’m content to live with it for awhile until I make up my mind. Either way, it’s an improvement over the fan that was there when we moved in and the pigtail that we wired up when we were painting. I’d love to hear your to opinion. 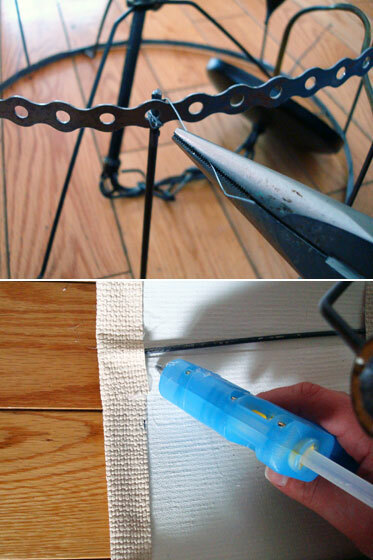 Do you think this is a #DIYfail or #victory? 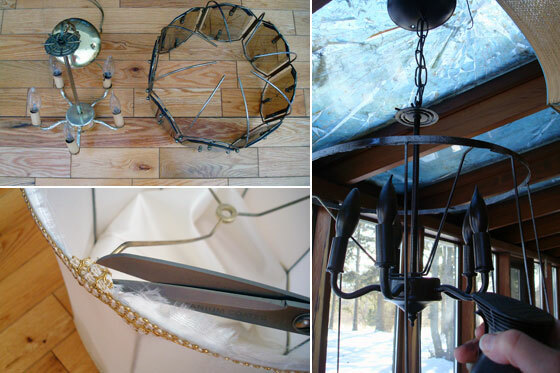 Have you ever made over a light fixture? I agree with you on the size. I never would have guessed the final result after looking at that first picture! I would have passed that over in the store in a second, but you really made a great improvement. I see the issues that you have with it, I would leave it until you find the perfect replacement! Oh that was a bad joke!